Approximately one million people die of liver cancer worldwide every year. Liver cancer, also known as hepatocellular carcinoma (HCC) or hepatoma, is common in Asia. In Singapore it is the fifth most common cancer in men. HCC tends to present late because it can grow within the liver without causing obvious symptoms to the person. Thus at presentation, the liver cancer can be 15cm in diameter or the liver is studded with multiple cancerous nodules. In Asia, most patients with HCC are also chronically infected with the hepatitis B virus (HBV). Chronic HBV infection can lead to liver fibrosis and eventually cirrhosis (hardening of the liver). While normal liver has a great capacity to regenerate and can withstand repeated insults from drugs, infections or surgery, the regenerative power of a cirrhotic liver can be significantly reduced. Most HCCs develop on a background of liver cirrhosis. The only way to cure HCC is to surgically remove the cancer. Whether the liver cancer can be removed or not is determined by a trained liver surgeon. When the cancer is determined to be inoperable then other treatment options are tried to control the cancer. One of the treatment options is selective internal irradiation therapy (SIR therapy) of the liver cancer. Radioactive material gives off invisible rays which can cause harm and death to normal or cancerous cells. The most obvious example of radiation treatment used to treat cancer is in breast cancer. The rays are delivered from a machine onto the breast or the chest wall in an attempt to reduce the risk of recurrent breast cancer. In SIR therapy, the appropriate amount of radiation material, called yttrium-90 (y-90), is delivered in the form of microscopic spheres into the liver cancer via the hepatic artery. These radioactive microspheres (Figure 1), once deposited into the cancerous tumour, will emit the invisible rays and kill the cancer cells. Which patient is for SIR therapy? In general SIR therapy is used to control patients with liver cancer. In those patients with an aversion to chemotherapy, SIR therapy can be used instead. It can also be used in patients where the liver cancer has stopped responding to or did not respond to chemotherapy. In some circumstances, SIR therapy has been used in conjunction with chemotherapy for and /or radio frequency destruction of the liver cancer. In a small proportion of patients who have one large tumour which is deemed borderline operable at initial assessment, SIR therapy has been used to downsize the tumour to a stage where surgical removal has become possible subsequently. How is SIR therapy delivered? Before a patient is given the SIR therapy, he will need to undergo an assessment to check if he is suitable or not. This assessment is done by performing a hepatic angiogram. The femoral artery in the groin is punctured (in the X-ray department) and a fine catheter passed into the hepatic (‘liver’) artery. A special medicine is then injected. After that a nuclear scan and a CT scan are performed to determine suitability. Once the patient is found to be suitable, he is readmitted for the SIR therapy. A hepatic angiogram is performed and on this occasion, the exact amount of y-90 microspheres is injected. The fine catheter is removed and the patient is returned to the ward for an overnight stay. SIR therapy is a relatively painless procedure. If the y-90 is delivered appropriately, the therapy has very few side effects or complications. The majority of patients are surprised that the treatment has been delivered and they are not aware of it. A small proportion of patients will develop treatment-related side-effects. Examples of these would include gastritis, peptic ulceration and radiation cholecystitis. SIR therapy is usually given once and the patient is observed for response. For those who fail to respond, the treatment does not preclude them from considering other forms of treatment such as chemotherapy, radio frequency ablation and chemo-embolisation. If the patient has responded then no further SIR therapy is required. At some future date if the liver cancer recurs or starts growing again the SIR therapy can be repeated. How long the response will last is difficult to predict. Each patient behaves differently. The duration can stretch from 6 months to several years after one single SIR therapy (Figure 2). Figure 2. 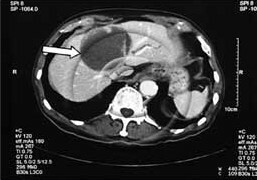 Huge liver cancer (black arrow) in an 83 year old man. 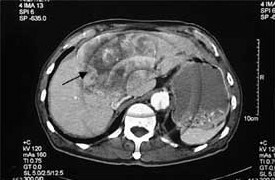 One year after SIR therapy, the liver cancer has 'liquefied' (white arrow). The patient is still alive 4.5 years later after ONE dose of Yttrium 90 microspheres. In 1999, SIR therapy was introduced into Singapore by Dr C K Leow. He established the SIR therapy service in the National University Hospital (NUH) when he was head hunted to join the Department of Surgery, National University of Singapore (NUS) as Associate Professor of Surgery and NUH as Senior Consultant Surgeon. After he resigned from NUS and NUH for the private sector in the second half of 2004, Dr Leow helped to set up the SIR therapy service at the Mt Elizabeth Hospital, the only private hospital in Singapore that offers SIR therapy. The first private patient treated with SIR therapy in the Mt Elizabeth Hospital was performed on 11th January 2006 under the supervision of Dr Leow. Copyright © 2019 C.K. Leow Associates Pte. Ltd.